It was cheap, easy to check in late, and a quick transaction. If we had brought our own sleeping bags, it would have been better. It’s clean and value for money , it’s absolutely basic but low cost ! Great for people just passing through ! Helpful staff, the breakfast choice is limited but no issues with the quality and it is excellent value for money, easy to find, easy parking. Basic accommodation with a basic price. Does the job. The location was good, easy to get to and lots of supermarkets etc. near by. Also good was that there was an area where we could eat our evening meal with microwave etc. The room was clean and had a sink and TV inside. There is a big parking space in front of the hotel. There was problem with the door locker, the lady tried to help us and gave us an other room, after it was not pssible to fix it - very engaged!! Thank you! Super comfy bed, and the price. You know exactly what you're getting with a Hotel F1. Staff very friendly and helpful.Spoke good English.Reception doesn't open till 5pm,although there is an ATM style self check-in outside it didn't like me.No problem to wait outside for 20 mins and chat. Plenty of outside space to sit and chat. Parking was plentiful and gate locked at 9pm (CODE PROVIDED). This was a perfect transit stop on way back to Calais. Even had time to look around Verdun after check-in and eat a good Italian meal at La Toscana restaurant near police station. 15 euros per person plus another 15 for bottle of wine. Walk to centre about 25 mins. Hotelf1 Verdun offers accommodations in Verdun-sur-Meuse. Free WiFi and free private parking are available at this property. Guests have access to a shared bathroom. Guests can purchase microfibre towels at the hotel at an extra cost of EUR 3 each. American Cemetery is 0.9 mi from Hotelf1 Verdun, while Verdun Battlefield is 0.9 mi from the property. The nearest airport is Metz-Nancy-Lorraine Airport, 40 mi from Hotelf1 Verdun. When would you like to stay at hotelF1 Verdun? House Rules hotelF1 Verdun takes special requests – add in the next step! hotelF1 Verdun accepts these cards and reserves the right to temporarily hold an amount prior to arrival. A EUR 10 security deposit will be requested for the remote control. This was one step up from a hostel. The shared bathrooms were like porta potties. The floor in our room was buckled, and the only latch in the door was loose and using only 1 fastener. Since we were on the ground floor, first room past the reception, we were very uneasy. There was not really room for one of us to move if the other wasn't on the bed, and one of us had to step outside in order for the other to get their bags ready. Also, the toilets are only toilets. Washing up must be done in your room, where there are no towels, cloths or even napkins. We ended up arriving later than expected and hotel staff had left so we had to check in on the front of the building on a atm like machine. I had reserved two rooms and it would only give me one of my rooms. I even tried to just get another room and it said they were sold out. The place was empty! Not a soul was there! We had three adults and children and we had to pile in one room to try and sleep some. 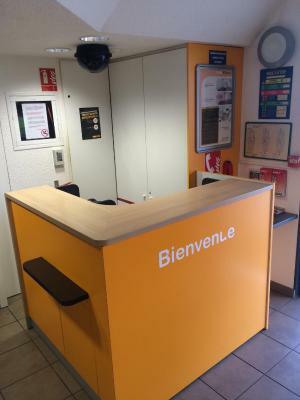 We tried the emergency number which was supposed to go to someone connected with that hotel in case of a emergency but it transferred us to a reservation hotline with someone not even in France. They tried to help us with a intercom system that was also supposed to go to someone that could help when things go wrong but no one ever answered. He was very friendly but there was not much more he could do other than report that no one was responding at the hotel. The rooms were very small which for the price was to be expected. The mattresses should not be even called mattresses they were so hard that they did not even give when I had to stand on it to help my child with the bunk. We had to put our linens on the bed. The sheets and blankets were folded up on the end of the beds. There is only one plug in the entire room and it is under the bed. The bathrooms have no sinks in them so you had to go back to your room and input a code in to be able to wash your hands. That was so gross. I am not a germaphobe and this is disgusting. The hotel staff we came in contact with spoke zero English only French. So if you do not know any French it is very hard to communicate with them. It was a hassle to try and get our 2nd room for the 2nd night of our reservation but we did eventually get it. Our two rooms were the last in the city for that weekend or we would have stayed somewhere else. We will never stay here again if we were ever in this city again. Location on the outskirts of town. Facilities need maintenance. Breakfast, cheap, and spare. Dirty, uncomfortable, unsafe and badly needs updating. It is fine that the amenities are basic but they are looking worn and past their best. This seems one of the better F1s. I was meant to receive an access code to get into the front door as the reception is not always manned. This was supposed to be sent onto my phone prior to arrival. However, I never received the code and had to phone reception several times without an answer, eventually I got through however, since nobody spoke any English or any other language except for French it was very difficult to make myself understood. I speak 4 languages but not French and had assumed that with either English, German or Italian I would be able to communicate, unfortunately not. Eventually with my very bad French I managed to explain that we had no code to get into our rooms and with much palaver was she eventually able to spell me the code. The staff didn't speak a word of English. The hotel's bathrooms were very dirty. No A/C and the room window could only open a few centimetres. Many shady looking people were hanging out around the hotel. The outside furniture is not too much. Very simple self check in, parking was free. This facility needs a new coffee machine and not providing a free towel is a stretch. Buying a towel there and taking it with me is difficult on a motorbike!